Hello from sunny southcentral Alaska! It's in the mid- 70's today and I'm hiding in my craft room, working on cards. I think I may have to jump in our pool later though. Anything over 70 is way too hot for this girl! I'm playing along with the current Power Poppy Power and Spark challenge again and my card colors are perfect for my weather today, bright and cheery! 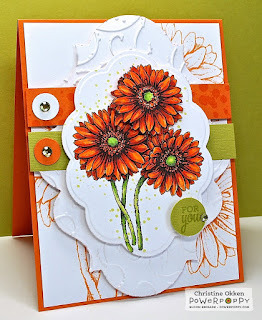 This time I am CASEing a lovely card by Bloom Brigade Member Christine Okken. Her card instantly caught my eye with its bold colors and fun design. I really love how Christine took the digital image and enlarged it for her background layer and changed the color of the image to go along with the main image. I decided to do the same thing for my card and used green for the color of my background image. Instead of using 2 additional layers I chose to just use one, the image panel. I used yellows for my gerbera daisies, it's just such a happy color to me! For the 2 strips across the card I decided to use the same card stock and left off embellishments. My sentiment also comes from the Gerbera Daisies set and I used a punch to cut the sentiment out, first changing the color of the sentiment from black to green. Oh, Lisa, you are on a roll, and what a fabulous CASE of Christine's card! 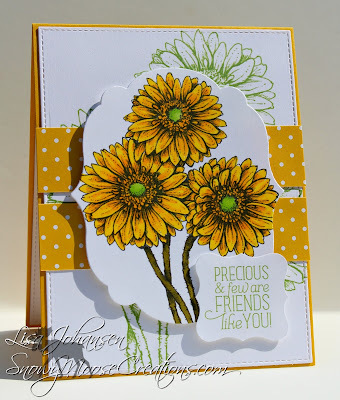 I love your colors and love how you've used the green in the flower centers and for your background and sentiment! 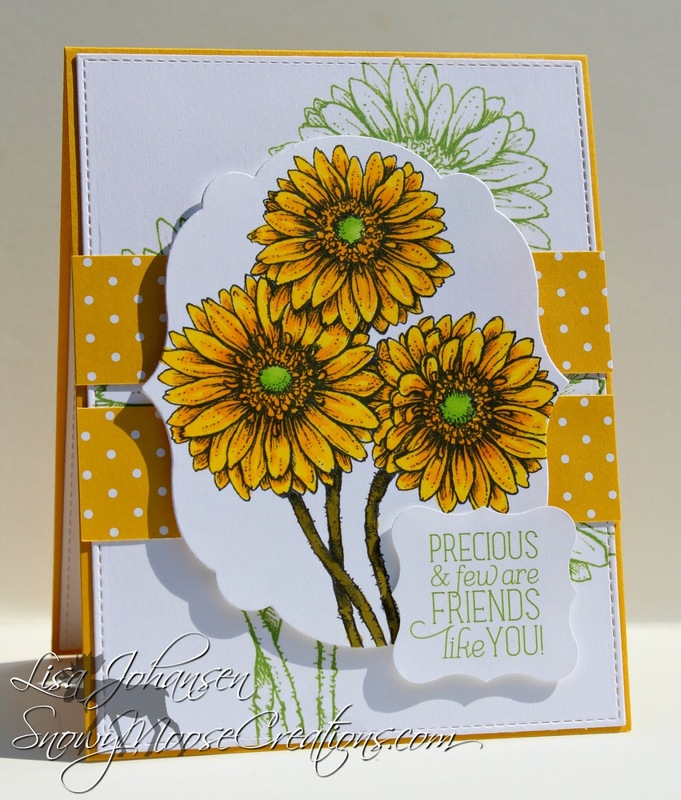 Another beautifully done card! Hugs! ACk..... So charming! I adore the yellow and spring feel to this. Your daisies look awesome, great case of Christine! 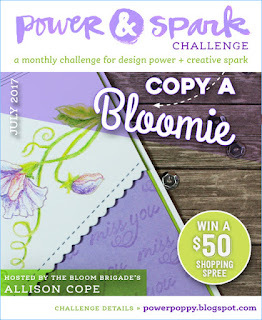 Thanks for playing in our July challenge at Power Poppy! Cool take on the Bloomie - love the colors! Lisa this is so fun! I love the colour choices in the green and yellow. It’s fabulous! I’m honoured you’d CASE me! 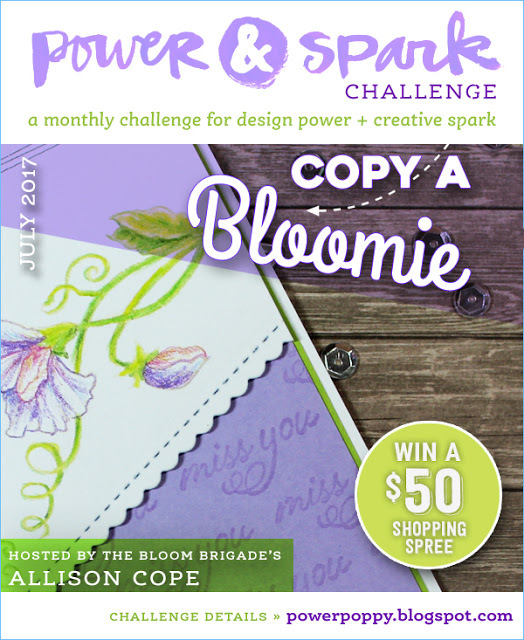 Thanks so much for joining us at Power Poppy this month!